Red Apple Smoke Juice 10ml Innova VG+PG liquid. The Fruity series comes in a variety of blends and strengths that brings you the delightful and luscious fruit flavors to captivate your senses. 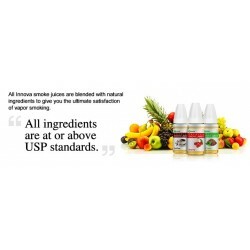 It is created with the finest, fresh natural ingredients, and elaborately designed to deliver the most enjoyable vapor experience that satisfies the taste bud of fruit lovers.